Credit scores can be empowering when it is maintained. A good score provides access to affordable financing and confidence in your ability to obtain services you need without the extra expenses incurred when deposits are required. Across industries, there is an increased emphasis on credit as a factor in applications. A decade ago credit scores were mostly a tool for lenders to evaluate consumer risk. Today it is used for everything from employment consideration to car insurance. The increased reliance on scores for decision making purposes has made the management of credit an essential part of your overall financial wellbeing. Debt payment information is reported to the credit bureaus. The information is then compiled and maintained in one place for others to view. Your credit report is essentially a summary of how you manage credit accounts and pay bills. Lenders typically update the information on a monthly basis to keep the report current and accurate. Credit bureaus then sell the information found on your report to other companies with an interest in how you manage debt. Your credit score is created by different companies who compile the data from the credit report and place a number on your level of risk, making up your credit score. This number changes based on the information contained in your credit file. Credit scores are a mathematical calculation assigning a three-digit number to your credit risk. The formulas used are based on many different data points as well as studies that indicate what information correlates with non-payment risk. Each credit score company has their own proprietary scoring algorithm that is used. The combination of both the credit score and report helps companies evaluate your credit worthiness and determine everything from interest rates on loans, to deposit and down payment requirements. Trans Union, Equifax and Experian are the three different companies that manage credit reports. Credit bureaus compile data reported from lenders creating independent files for each social security number. The result is that everyone with credit will have three different credit reports along with different corresponding credit scores. The information on each report may not be the same because not all companies report to all three bureaus. Personal information such as address, social security number, and birthdates. Previous addresses are also included. Credit accounts such as mortgages, car loans, credit card accounts and student loans. Account history typically remains on the report indefinitely, however, negative information must be removed after 7 years unless there is a bankruptcy, which will remain on your file for 10 years. Payment history such as account balances, credit limits, the minimum payment due, past due amounts owed, date of last payment, actual payment made, and open and close dates are included. The first date of delinquency, charge off date, and balloon payments are other information that might be provided based on account activity. Delinquencies for non-credit accounts such as bank accounts, cell phone providers or utility companies may be reported if the account is turned over to a collection company. At that point, the collection agency will most likely report the unpaid debt to the credit bureau where it will remain for 7 years past the default date. Public records such as foreclosures, tax liens, bankruptcies and other liens or judgments will also be reported on the credit file. Inquiries for credit. There are three types of inquiries. Companies who are considering an offer of credit review reports that fit their target audience. Companies with whom you currently do business will review your credit during an account evaluation. When you fill out an application, many companies will view your report during the processing of the application. 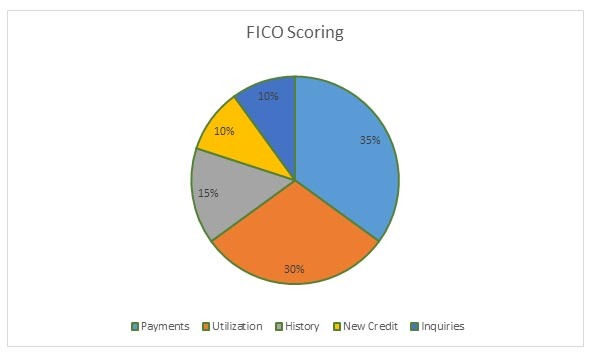 While there are many different credit scoring companies, FICO is the largest and is used by 90% of lenders. The scoring range for FICO is 300 to 850 to measure consumer risk. The higher your score the lower your risk to the company, the better terms you will be offered. Regardless of which scoring company is used the elements that make up the credit score are very similar. History of payments is a measure that calculates when payments are made in relation to when they are due. Payments more than 30 days late will generally result in a negative impact on your credit score and that will affect your score for seven years. Late payments beyond that time period are no longer recorded on your credit report and do not factor into the score. More recent late payments are weighted more heavily than older late payments. Utilization is a ratio calculated based on revolving accounts. It calculates the amount of debt you owe in comparison with the credit limits which are available. For this reason, many consumers with excellent credit seek high debt limits even when low or no balances are carried. As debt balances creep up, lenders may also lower your credit limit, creating a more profound impact on your score. Your credit cards could suddenly be maxed out because of the limit reductions. Credit history looks at the amount of time your credit has been established. Accounts remain on your report and indicate whether they are open or closed, establishing your credit history. Type of credit carried analyzes the number of fixed payment accounts in comparison to revolving accounts. Scoring agencies like to see a mix of both to evaluate your ability to maintain good credit. Mortgage loans, car payments and student loan payments are in one category because the loan is paid over a fixed period of time. Variable or open ended accounts like credit cards, measure your ability to control spending even when credit is available. The more you understand about what your credit score says about you, the better you will be able to raise your score to the point where you will see benefits.